The Princeton High School Junior Class of 1949 presented a tribute entitled, “The Life of Miss Myrtle Smith” and in the program, the quote below her name said, “To live is not to live for one’s self alone; let us help one another.” Today I want to talk to you about how appropriate this quote is and was for this woman who influenced so many in this community of Jacinto, and beyond. Cora Myrtle Smith was born April 5, 1900, the oldest daughter of George and Mollie Smith. She grew up in the Jacinto community and lived there for most her life, occasionally leaving to teach school or to take her father to McFadden Springs, near Hot Springs, so he could receive treatments for his health in the 1930’s. Not until Myrtle suffered a devastating accident in the mid-1970s did she leave the home she grew up in, for good. However, she left behind a legacy of the paper kind that has been invaluable to me, as well as to many others. One afternoon earlier this summer, there was a message on the Dallas County Museum’s Facebook page. A young woman wanted to know if we had any information about the Swaty family, or if I’d ever heard of a community named Swaty. That name sounded vaguely familiar to me, so I forwarded the question to Melrose. She replied she had gone to school with one of the Swaty family members, but I should ask Aunt Doris, who would know more about the family. I wracked my brain trying to recall where I had seen that name, and it suddenly dawned on me. I dug around in some boxes and files until there it was – a piece of notebook paper, yellowed with age, with very familiar cursive handwriting on it. At the top of the page was the heading “Swaty” and underneath was a list of names and a one- or two-word description beside several of them. I took a picture of it and sent it to the young woman, who immediately responded with a big thank you! I explained to this woman how I happened to have this piece of paper. I told her how my mother had inherited most of the papers that had belonged to her aunt, my great-aunt, Myrtle Smith. Aunt Myrtle had made lists of people she knew, and I found many of them in her papers. These lists were how she kept everyone straight in her mind, their lineage, who belonged to who. Her papers are a wealth of information. For instance, I know from looking through her 1962 appointment book that Nora Bell’s birthday is March 9. She also wrote on the cover, “Saturday, 12:30 P.M. January 26, 1963, Ice on the ground!” I know from a list of phone numbers that she could call Louise Mann at 2-7300 or Mr. Ben H. Owens at 2-3878. She had many long distance numbers listed, also – remember dialing 121 when it was long distance? – and she could call John Steelman at 121-693-5672. Aunt Myrtle had so many letters – seemingly hundreds, which is probably not an exaggeration – both to her and from her (such as the ones she wrote to her mother while tending to her father at McFadden Springs). I found it interesting that if you had read the letters she wrote, you would know she just had to be the oldest daughter and the oldest sister. You know – they’re not bossy, they just know what you need to be doing, and when and why and how and where you need to be doing it. Myrtle was no exception, and in fact, being a teacher is probably the reason why she wrote her instructions in great detail. In a letter written on October 28, 1935, to her brother, Conger, she wrote: “Wonder what you and Mamma are doing today! Don’t work too hard, or too long without a resting spell. Be careful about your eating. “Tis very important. Use little, if any, grease. Fry your meat out crisp. It’s the grease, not the bacon, that isn’t good for you. Buy and use lots of fresh fruit. Eat an apple or an orange when you are hungry. Drink lots of water. It’s cheap when you consider sickness and medicines and doctor bills!” I love how she is doing what she can to take care of her “little” brother, who at the time was 32 years old. Two days later, she wrote to her mother, Mollie, “… Mamma, how are you? Be sure to take medicine when you need it but don’t take salts. It will kill you.” Even in later years, she wrote her sister and brother-in-law, Connetta and Robert Roach, on how to take care of a poinsettia. She wrote to them on January 5, 1970: “You keep the poinsettia and let it be yours….After the plant’s usefulness is over, place it in a dry place where it will not freeze. Do not water it, or at least, very little, and let the soil dry up. Next May bring the plant out, cut the stem back about two-thirds, wash the soil off the roots and repot in new soil.” I wonder if they did what she said to do. These are good instructions, so I’m saving them for myself! Aunt Myrtle had a kind heart and a generous spirit, and she shared what she had with those in the community. 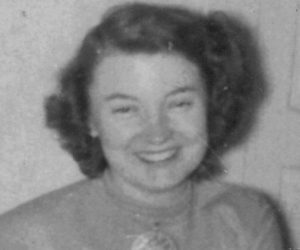 She had saved innumerable thank you cards within her papers and they all pretty much said the same thing: “Thank you for the money.” She might have tucked in a dollar bill in a birthday card – five dollars if you were graduating – maybe ten or so if you were getting married. She saved many programs from graduations. One was from the University of Arkansas School of Medicine when Rex Norman Moore graduated on June 16, 1952. Another program was from the Henderson State Teachers College Commencement in 1955. In the section where the names of graduates were listed, she wrote “Ones I know” and put a checkmark beside many of those names – including Thomas Marvin Frazier, Laura Glenn Mallett, and Mary Ann Taylor. Another program, also from Henderson, listed Cora Myrtle Smith. In 1957, at the age of 57, she finally had her bachelor’s degree – in Education. “The small rural schools that dotted Dallas County early in the century have gone the way of wood stoves and coffee grinders. All that remains of some of them are empty buildings, while others are no more than blackened rubble heaps on the ground. Myrtle Smith of Jacinto is one of these teachers. She taught in the rural schools of Dallas County for 44 years. Miss Smith’s parents, Rev. and Mrs. George S. Smith, spent several years teaching in some of these country schools. And, their daughter entered her career as a teacher even before she had graduated from the school where she began teaching. In 1919, with an eighth grade education, she received a license to teach the second grade. However, she was hired by the Mount Carmel school at Jacinto to teach the upper six grades – this meant that she was a student in her first class. As her students were her contemporaries and older than her 19 years in many cases, discipline became a major problem. She remembered having trouble with a couple who were continuously exchanging letters during class. ‘He was older than I was, and he would always sit in the back of the room writing little notes to his girlfriend, who sat in another corner of the room,’ she said. ‘I caught him one afternoon and demanded the letter. He held the letter behind his back and said that I wasn’t getting it, so we locked horns. …For the next few years, Miss Smith taught in several of the small schools in the area, among them Eaglette, Midway, Oak Grove, Nix, Ebenezer and Cooterneck. At Eaglette, a thriving lumber mill community in earlier days, she taught the entire school of 55 students by herself. While Miss Smith was teaching, she was also working on her own high school education at Bearden and Sheridan in her spare time. She graduated at Sheridan Missionary Baptist College in 1928, and immediately reentered to begin work on a college degree. But, it was 30 years before she was able to receive her degree from college. The depression, family illness and the need for her teaching services kept her from continuing her education. …In 1937, Miss Smith began teaching at Princeton School where she spent the next 27 years of her career. Princeton School was one of the larger rural schools in that area and had absorbed some of the smaller schools that Miss Smith had once served. 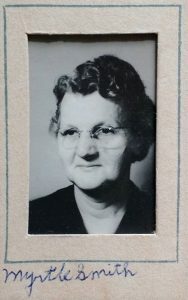 Miss Smith retired in 1968. Yesterday I met cousin Melrose down at the Dallas County Museum on Main Street in Fordyce. We planned to discuss our upcoming presentation in August at the Clark County Historical Society meeting in Arkadelphia on our book, My Own Precious One. First, though, we went over ideas we had for the Smithsonian traveling exhibit the museum will host beginning in April 2017, Hometown Teams: How Sports Shape America. I wanted to go to the Sports Museum, across the street and at the end of the block, so we stepped out into the 90+ heat to walk over to it. The Sports Museum is in a beautiful old building, formerly known as the People’s Store, a longtime fixture in downtown Fordyce. The original hardwood floors and soaring ceilings lend a stepping-back-in-time feeling, perfect for showcasing history. Melrose pointed out how the brick on the back wall was again chipping onto the staircase, and I texted photos of the wall from the outside and the inside to my brother, who works at an architectural firm in Little Rock and has experience dealing with these type problems. While we waited for his reply on how to address the issue, Melrose showed me the empty lot next door where a building once stood. The brick front facade was all that remained, but even that had fallen over during a storm earlier in the year. That space has so much potential, and we stood there, envisioning children playing games or watching demonstrations, or museum parties that would tie into the theme of the exhibit. We finally had enough of the heat and started walking back to the museum. A man with a big voice, standing in the shade of an awning and talking to a friend, hailed Melrose, and we went over to talk to him about what Fordyce was going to get in the spring. He became very animated and was thrilled to hear about what could be a big draw for Main Street. He and his wife have businesses on the street, on both sides, and also own the now-empty space by the sports museum. About that time, his wife walked up and she took us down to the lot. We talked for a while about the plans they have for the lot – fixing it up and turning it into a wedding venue or party location – before returning to the sidewalk. We strolled along, talking until we reached their store on that side of the street. It’s a flea market, with several items on display in front of the shop. I idly looked at them as I made my way past the storefront, following Melrose. I glanced down at a wooden bench, covered by an old quilt. When I saw a name stitched in the middle of a block, I paused to look at it. “Look, Melrose, it’s a friendship quilt!” She has the ones that once belonged to her mother on display upstairs at the main museum. Upon closer inspection, we saw other names and a few sounded familiar, so we picked it up and began looking in earnest. “Look! It’s Edith Smith, Uncle John’s wife! Oh, my word! There’s a Mrs. Nutt with a Martha Jean beside it – that means that’s Vivanaye! Martha Jean was her daughter who was my Home Ec teacher in high school!” We kept looking and marveling at all the names we knew. The woman called over to her husband, who had walked into the store. “She said this woman was her Home Ec teacher!” We all chuckled over how small the world is. Suddenly I saw in faded red thread an embroidered signature so familiar and dear to me. “That’s my grandmama!” Tears sprang to my eyes and my throat tightened. 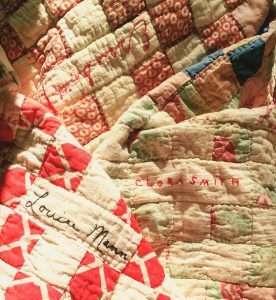 My sweet grandmother, Essie Smith, had been a part of this friendship quilt. In the Jacinto community, as in many communities decades ago, women would be invited by friends and/or family to make a block with their names in the middle, to be sewn to all the other quilt blocks. A quilting bee would take place in the quilt-receiver’s home, and the women gathered together to stitch and talk, a welcome respite from their daily routines. I was reflecting on this as Melrose and I held the quilt between us when I looked down, and there it was. 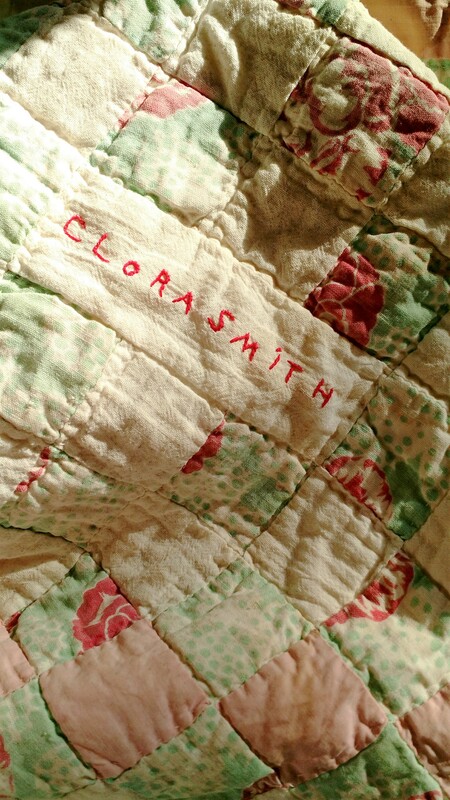 “Clora Smith” in block letters, embroidered with the same faded red thread as her mother’s. I pointed it out and told them, “There’s Mama.” By now, I was nearly overcome. We told the woman how my mother had been an expert quiltmaker and how that made finding a quilt with her name on it even more special. I looked up and asked, “How much is this quilt?” She didn’t know, she said, but she would ask her husband, who had been inside the store. As we folded the quilt, I looked at Melrose and quietly told her, “I’ve got to have this quilt.” Then just before I put it down, one last look and the trinity was completed. 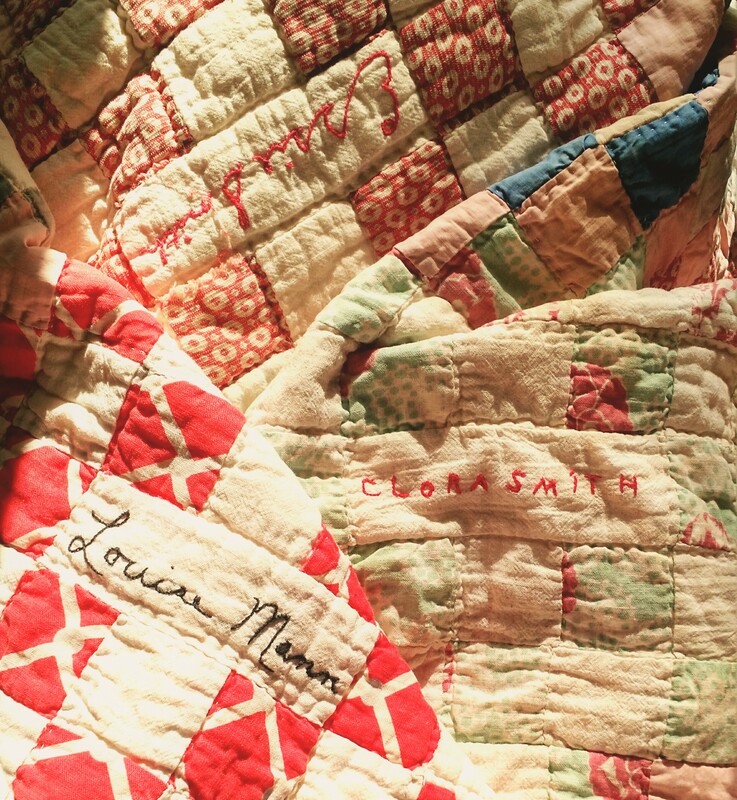 “Louise Mann” was stitched in black and anchoring a corner, two blocks down from my other grandmother. It was like the three of them had gathered together to say hello to me, in a message from heaven embroidered on an old quilt. Shaking my head, nearly speechless, I waited for the price. The woman was kind enough to tell me to take it with me back to the museum and take pictures of it while she and her husband discussed the price. That’s what Melrose and I did, and we sat upstairs discussing the names and the people we knew from long ago. Mira Lee. Joan Smith. Mildred. Miss Amy. Lucille Moore. Dessie Walker. Drue Smith. Irma Deadman. Edith Smith. Virginia Walker. Nora B and Kathy. Velma Crow. Essie Smith. Dean. Louise. Miss Pearl. Loeta. Ruby Hollman. Mrs. Green. Marion. Martha Jean. Clora Smith. Daddy. Mother. William. Tiny Smith. Louise Mann. Lynn. Maxine. I had only a small amount of cash with me and had not brought a check when I came to Fordyce. Melrose said she could help if needed. Anxious to find out the price, knowing how much quilts sell for in other places, we found the couple at their other store, next to the main museum. They sat there a moment when I asked what they had decided. They didn’t speak right away and my heart fell. I just knew it was going to be something I could not justify spending, even for something so priceless as this quilt was to me. The wife said quietly, “$50.” I thought I had misheard her. “How much?” She smiled and said, “$50.” Melrose went to get her money. I explained to this nice couple how this quilt had to have come from Jacinto. Wondering where it might have come from and how they had found it, we went back and forth on ideas. Finally, the woman asked if there was someone still alive from that community, probably in their 90’s, who was now in the nursing home. I thought a split-second and replied, yes, Vivanaye Nutt. Their faces lit up, and they told me that’s who it was. Vivanaye and her husband had been long-time, down-the-road neighbors of my grandmother and her husband and I had known her all of my life. She was the last survivor of the four and had continued living in the house in the big turn for many years after her husband had passed. When she went to the nursing home, apparently her things were disposed of, and the couple had procured this quilt. She told me a woman had come to the store just the day before, looking for a quilt to use, but this one wasn’t what she wanted. I told her it was because of Divine Providence because that quilt was meant to be mine. They laughed and said they guessed so. I reached down to hug the woman tightly, maybe a little too tightly. When you get a chance to hug someone who helped bring you a message from heaven, you hug them as hard as you can. Melrose returned with the money and gave it to the woman. We walked away, me hugging my new old quilt to my chest, close to the heart that has these names embroidered on it. *** Please visit Main Street Flea Market in downtown Fordyce. The couple in this post are some of the nicest people you will ever meet. They have adopted Fordyce as their hometown and are making every effort to bring vibrancy back to that area. Their names are Loretta and Keith Cotton. Loretta is quiet but full of ideas and Keith has a megawatt smile with a voice to match. When you go, please tell them Sandra Parham Turner sent you. If they don’t know who you are talking about, say she’s the teary-eyed woman with the friendship quilt. It turned out that Mama was crazy. I have to go back a few years before that fateful argument, to the spring of 1984 when I first met Steven Turner. Steven was a cute friend of my spring/summer of 1984 boyfriend. He had almost jet-black hair and these piercing, bright green-blue eyes that were warm and crinkly when he smiled. He was quiet, and I remember being slightly ill-at-ease with him at first because he was good-looking and I assumed he knew it. After awhile, though, I realized he didn’t, and we got along when we eventually did speak to each other. There was an assortment of young men who all hung around together in that small town, and I spent the summer of 1984 hanging around with them, more of a sidekick than a girlfriend. Steven was with my boyfriend and me on many of our dates, including what would be our last one in late September. It would be seven years before we would see each other again. There were a few moments from that summer of 1984 that would stand out in the years to follow. Steven drove a little white truck for a time, and I remember getting in it with him on one occasion while Van Halen’s ‘Panama’ was on the radio. He sang along with David Lee Roth, and I would not hear that song again without Steven’s voice echoing in my head. Another time during that summer, Night Ranger’s ‘Sister Christian’ was released and when it came on the radio, Steven told me, “This is your song.” “Why do you say that?” I asked, and he shrugged and said, “I don’t know, it just is.” Once again, I never heard that song without it reminding me of that moment. Maybe I would have forgotten about him otherwise, I don’t know; but when that song came on the radio, I would immediately think, “Steven Turner said this was my song,” and I would listen intently to the words. Now and then, on a visit to Fordyce, I would see that little white truck in town and catch a glimpse of him, but I moved on to other parts of the state and my trips there were not as frequent. November 30, 1991, the Saturday after Thanksgiving, would become the date of a turning point in my life. My then-boyfriend was visiting from out of state for the holidays, and we had driven to Pine Bluff, for me to find something to wear to a honky-tonk by the name of Bad Bob’s. I didn’t want to go. We didn’t get to see each other very often and going out to a club wasn’t how I wanted to spend our time together. But, that evening found me in a new red sweater and a black suede mini skirt, sitting in a booth across from my boyfriend. Loud country music played, and we watched people line dance as we talked about whatever it is two people talk about when they don’t know fate is about to walk in the door. I’d glance up now and then at people as they passed by us. One person walked by, and my eyes widened. “That’s Jimmy Stell!” Sure enough, it was Jimmy, who had not changed in the seven years since I’d last seen him that summer of 1984. I watched him as he passed, oblivious to me. Behind him was Timmy, his cousin, and a couple of guys I didn’t recognize. One of them had almost jet-black hair and piercing, bright green-blue eyes that scanned the room as they walked by us, and my jaw dropped. “OHMYGOSH that’s Steven Turner!” My heart sped up, and I couldn’t help but smile. The rest, as they say, is history. The morning of April 15, 1995, came at 7:00 am for me. My best friend had spent the night for our last sleepover together at my parents, and we had gotten up to have breakfast. Daddy sat at the kitchen table as he ate his bowl of Raisin Bran, and his one piece of advice to me was, “You just need to remember that Steven is…..conservative.” I laughed and told him, “Daddy, trust me, I already know that!” It was one of those qualities I liked about my future husband. He knew where his money went, and he didn’t spend it to impress anybody, even me. 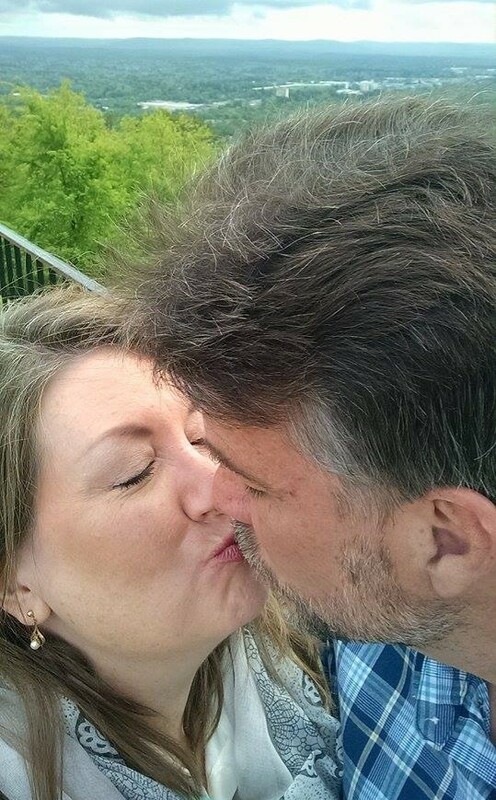 We would be honeymooning on a small budget, driving through Louisiana, Mississippi, and Alabama, stopping wherever we wanted to before we returned the following week sometime. My niece and flower girl had to be carried out to cry in the narthex. My best friend & maid of honor unknowingly stood on my cathedral-length train. 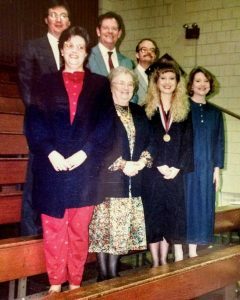 My too-heavily embellished dress wouldn’t stay on my shoulders (“every time we bow our heads to pray, you yank it back up as best you can!” my oldest sister advised). The photographer moved the video camera so that instead of capturing the processional, the first 20 minutes of footage was of my grandma snoring in her wheelchair. These are some of the moments which stand out the clearest from that day. A moment, in particular, I can recall vividly was when the music of the wedding processional swelled, the doors into the sanctuary were re-opened, and I looked up the aisle to see a handsome young man, with almost jet-black hair and piercing, bright green-blue eyes that lit up when they saw me. My father walked me down to him, held out my right hand, picked up my soon-to-be-husband’s left hand, and joined them together. We said our vows, exchanged our rings, and practically flew to the narthex, where the photographer captured the elation we felt as a husband and wife with a wedding behind us, as my brother stood in the background, holding his then-pacified daughter. The honeymoon, like our marriage, would not be all bliss. In fact, it was a fairly accurate representation of what the next twenty years would be like – the joy, the anguish, the anger, the contentment. It has not been all hand-holding, as marriages rarely are. There have been times when one set of hands has clasped firmly around the other’s neck – figuratively speaking, of course. But there’s never been a time when one set of hands has reached out, that the other hasn’t grasped them and held on tightly. All those years ago, I never would have believed they’d belong to someone from Fordyce, Arkansas. I’m thankful my mama was crazy. 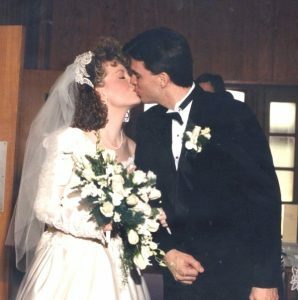 ****This post was written as a 20th-anniversary gift to my sweet husband, who I love with all of my heart. These photos were taken exactly 20 years apart, at almost exactly the same time – 2:35 pm. I am even wearing the same earrings, a gift from Steven on my 25th birthday many years ago. I never thought the first piece I would write that went to print would be my mama’s obituary. Somehow, I think she would have liked that, especially since I’ve learned a lot from her about telling a story. Our conversations were always in depth and with much detail, leaving nothing out, and now that Mama is no longer here to listen to my side of the story, I wrote this, as a type of catharsis, of what happened in the days before the obituary went to print. One morning after Sunday school back in February, I looked down at my phone and saw a missed phone call and a text from my oldest sister, with the ominous message, “call me emergency.” The fear I had at that moment, the dread that only bad news would precipitate a message like that, caused my hands to shake even more than usual while I hurried to get to a window for a better signal, and I clumsily swiped and pressed the phone’s screen to connect me to her. Her voice came over the line with a rush of words that I barely could comprehend. Our mama had fallen somehow the evening before while reaching for a bag of cookies my aunt had brought and our dad had just walked past her and into the bathroom when he heard her fall and he got her off the floor and into a chair and he thought she was okay at first but then an ambulance had to come to the house and get her ……. Everything she was telling me was going into my head and whirling around, but making no sense. All I could do at that point was frantically motion to my husband across the room to come to me. We rushed to tell our son we were leaving him to go to the hospital 40 miles away where Mama was, and our family would be waiting on results from a CT scan to see if she had had a stroke. What a long ride to the hospital! My mind was frantically trying to recall when I had last spoken to Mama – when was it? Today was Sunday, so did I talk to her Thursday? Or was it Tuesday? We had gone to see them all the Sunday before, something we didn’t normally do. Typically I visited once a week on Tuesdays, to get groceries and fill Mama’s pill dispenser, but we had gone to visit seven days before and we took care of those things then. I wrapped my arms around myself and tried not to panic as each long minute ticked past. All I could cling to was knowing I had seen her just seven days before and surely this wasn’t going to be as bad as everyone thought. I had seen her just seven days before. What a relief once we got there – she didn’t seem so bad as I had thought she would be. Her left side wasn’t moving, but maybe that could recover after she had time to heal, with the right therapy. Her eyes weren’t open completely, but she was trying, you could see the fluttering of her eyelashes. She was speaking some in response to questions. Mama knew me, even if she wasn’t seeing me, because when she heard my voice, she spoke my name. She asked about my son, her grandson, and if he had gotten his scholarship. I had intended to call her after I got home from church that afternoon. I was going to tell her all about the Scholar Recognition Day we had attended the day before at the college where Jacob will be a freshman in the fall. We had talked about it, several times, in our last couple of visits and in that last phone call, whenever it was. Just a day before, I had posted a picture online of him with his award and I knew she must have seen it. I told her yes, he indeed had gotten the scholarship and heaved a big sigh. What a relief – she remembered everything still! My blood immediately chilled when she asked, “Where is he going to school?” Later, her “good” right hand searched and searched for something on her bed. Over and over I asked, “What are you looking for, Mama?” “My remote.” Later, “My phone.” These were the two things she kept within reach at the house. Dreading what I knew she would say, I leaned over her and gently asked, “Mama, where are you, do you know?” She replied, in a weak but firm voice, “I’m at home.” I knew then that things were never going to be the same again, and it was a moment that made me want to sit down and cry, just as I had as a child when Mama told me something I didn’t want to hear. What a long ride back home! We had to leave after only 4 hours, to beat the winter storm that was due to arrive that evening. My two sisters would stay with her a few days and then I would return and take their place. That was the plan, at least. The mostly balmy winter we had had suddenly turned to ice and sleet and snow. I can’t remember what happened, in what sequence; all I remember is I had to go to an appointment in Little Rock the next day, and drove home from it with snow swirling on the roadways. Once I arrived home, the storm hit, and I was unable to leave home again. I thought I would make it back to the hospital by Tuesday afternoon and waited for the thaw to arrive. Meanwhile, an emergency of their own forced my oldest sister and her husband to have to leave, and our other sister was there alone with our dad to take care of Mama. I could have, and should have, left my home that day when everything thawed, but I didn’t. I had a doctor’s appointment on Thursday that unfortunately, I could not put off any longer. I couldn’t risk getting snowed in again, so I stayed home. By the time I finally was able to return Thursday after seeing the doctor, everything had changed. Mama was asleep, or whatever you call it when someone has had a stroke and can’t be roused. She slept and slept while others around her talked and talked. Finally, after everyone had gone, Mama came to somewhat, and spoke our names and seemed to be somewhere in there where we couldn’t quite reach her. I spent that night with her, alone, watching her from my bed. Each little sound she made, I sprang up to check on her. Nurses came in and out, checking on her and reassuring me, and through it all, I felt like I was on the outer edges of a dream. Somehow I was awake, but I had to be dreaming it all because none of it felt quite real. Each time, I would climb back into the guest bed, pulling the covers over me, and looking across to Mama’s bed, so I could watch the rise and fall of her sheets as she breathed; dreading that they would stop moving, and I would be helpless to do anything. It was a dreadful, long, nerve-wracking night. The morning came early, considering I had slept maybe an hour. The day shift nurses and staff came in to check her vitals, which made me get up out of bed for the last time. During the day on that Friday, visitors came and went. 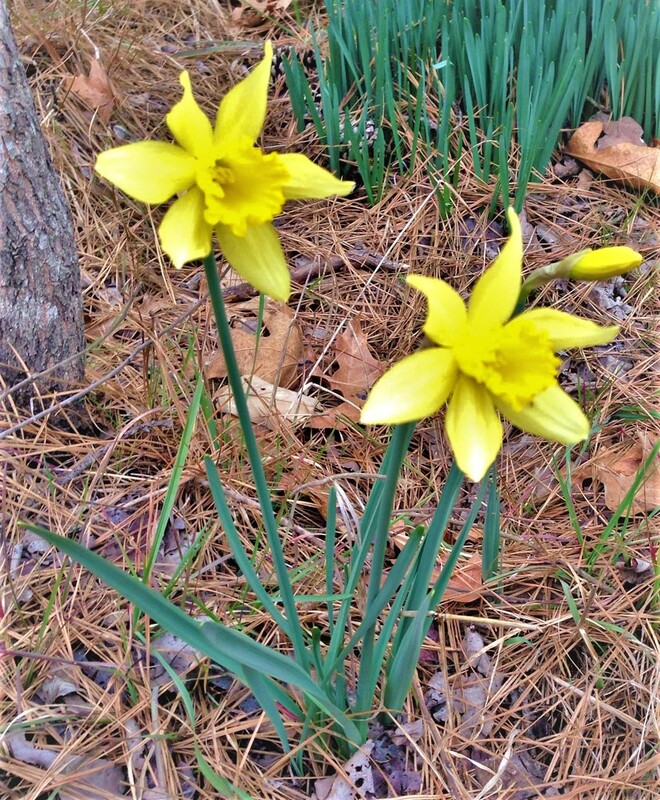 Mama responded to our voices but grew quieter and quieter as the day wore on and a fever began. By nightfall, Mama had spoken her last; only I don’t know what it was she said because, at the time, we didn’t know it would be the last thing she said. The nurses gave her medicine to bring the fever down, which also made her go into a deep sleep. We also didn’t know it at the time, but the deep sleep she had slipped into was to be one from which she never would awaken. My brothers, my sister, and I would be there at her side for hours, talking; until one by one, they left, slipping through the door into the quiet hallway, and leaving Mama and me to spend what would be our last night together. I leaned over her bed, smoothed back her hair gently, and kissed her forehead, telling her, “I love you, Mama,” before going to my bed. This time, I would sleep deeply, but awaken each hour to the sound of her breathing loudly and tortuously. The nurses once again would come, checking on her, and reassuring me that it was only the medicine causing her to gasp so, that she was only sleeping deeply and not to worry. It was another dreadful, long, nerve-wracking night. She would sleep in the days to come, and Daddy & I took turns caring for her, once my brother and sister returned to their homes after that weekend. Back and forth I would drive, leaving my home in the mornings to drive 40 minutes to the hospital, where I would sit by Mama’s bedside all day until it was time for Daddy to come back to her room and for me to drive back home in the evenings. Each day, Aunt Doris, Mama’s only surviving sibling, or their cousin, Melrose, was there to sit with Mama and me some of the time. At the beginning of the week, Daddy asked me to write the obituary, telling me, “You don’t have to start on it yet.” But I did, almost immediately, and spent the days I was with her, working on it while I sat at her bedside, listening to her breathing. I would put my paper down hurriedly and jump up to notify the nurses whenever she showed any sign of distress, anxiously wait for them to respond, and once she was calm again, I would pick the paper up and write some more. It was hard to concentrate sometimes with that tension, so once I arrived home in the evenings, I would take the paper and fine tune the details as a grim way to unwind from the day. Aunt Doris and Melrose helped me with details, and together we came up with an obituary I thought Mama would approve. Once I finished it, my siblings were given copies to critique, but pretty much what I had written became the final copy. Mama was finally at peace. I tried to feel sad, but after having witnessed what she had gone through, it was impossible at that moment. In fact, I felt almost relieved. The grief and mourning would come later. But for the time being, my husband and son returned with our pizza, and we ate in remembrance of Mama, our first meal together as a family in nearly two weeks. The obituary was in the Sunday paper. It couldn’t have gotten better exposure, and I knew Mama would have liked that. It told as much about her as was possible – but even a paid obituary has its limits. I would have liked to have written more, but at least, the people who had known her only since the essential tremor had limited her could discover that she was more than what had met their eyes. She was once again the teenage girl who won the blue ribbon at the county fair for her double wedding ring quilt. She was the young lady who was Valedictorian of her senior class. She was the mama to five children and always made them a hot breakfast before sending them off to school. She was intelligent, even if she couldn’t always speak up to be heard and understood, and she was generous, and kind, and gentle. She also had a very dry, deadpan sense of humor. I don’t remember when I first noticed that she and Daddy had had four children in the first eight years of their marriage, and then waited more than six years before having me. I do remember that I asked her, “Mama, was I an accident?” Without missing a beat, she replied, “You all were.” I’ve told that story so many times in the years since, and it never fails to make me laugh. I thank her for that sense of humor, and for passing it along to all of her children. Someday, we will get together and tell our Mama stories, and we will remember good times, with her and as a family, and we will laugh together again. Clora Myrtle Smith Parham was born in Jacinto, Arkansas, on June 11, 1933, to Reverend Ray M. and Essie Jones Smith. She grew up in a home just up the road from her birthplace. On that land years later, she and her husband built the cabin she always wanted, for family gatherings of generations to come. She graduated Valedictorian of her class from Princeton High School in 1951 and attended Magnolia A&M (now SAU) and Little Rock Junior College (now UALR). She attended Beech Grove Baptist Church. She died on Wednesday, March 4, 2015, at the age of 81. Clora was a homemaker in every sense of the word. She married Edward Parham, also of the Jacinto community, on August 8, 1953. They had five children and they were each Mama’s favorite. She was an excellent cook and for nearly 30 years made sure her children had a hot breakfast every morning before sending them to school. She was the family caretaker and helped care for her parents and in-laws when it was needed, as well as for extended family members. She was a kind and generous person with a keen mind, a gentle spirit, and a very dry sense of humor, a trait she passed along to all of her children. As quiet as she was, her absence will be felt strongly by her loved ones. 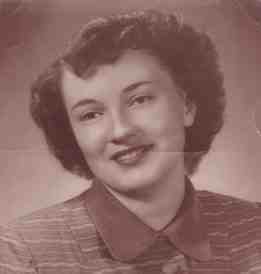 Clora was a genealogist who researched extensively all sides of her family, as well as her husband’s. She was introduced to the internet in 1997 and was thrilled to the world it opened up to her in researching and connecting her to others in that same pursuit. Being an historian and a storyteller, she compiled The History of Jacinto and was a key contributor to Keeping Up with the Joneses, a family history/cookbook. She was a lifelong expert quilter, and made innumerable hand-pieced quilts. She was proud of winning the blue ribbon for her double-wedding ring quilt at the Dallas County Fair as a young teenager. She could create anything using needle, thread, and fabric. She will be buried with her final quilt. Clora was a member of the Daughters of the American Revolution, Chicot Trace Chapter, serving as recording secretary for many years. She was a member of the Mayflower Society and the American Legion Ladies’ Auxiliary. She was a supporter of the Senior Citizens’ Center and was a Dallas County Museum volunteer, who also used her organizational and sewing skills to assist with fundraising. 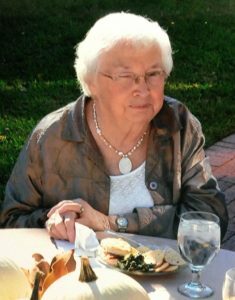 Clora volunteered in many church and civic activities throughout her life. Clora’s family was her greatest accomplishment, with her children and their families numbering 31, with another one on the way. As the matriarch, it seems fitting that she be the first to go, so she would never suffer the loss of one of them. She will have everything ready and waiting for them when they come home, just as she did in her time here on Earth. Preceding her in death were her parents, brother, Randolph, and sister, Rosie Jane Jones, as well as many beloved family members. Survivors are her husband, Edward, of the home, children Edward Ray (Teresa) Parham of Camden, Carol Jane (Neil) Wright of Lewisville, Rodney Jay (Kim) Parham of Little Rock, Susan Elaine (Raymond) Adams of Texarkana, and Sandra Ann (Steven) Turner of Sheridan. Her grandchildren are Stacy (Dan) Breshears, Aaron (Jessica) Wright, Kenny (Nicole) Wright, Nathan (Gee) Adams, Nicholas Adams, William and Caroline Parham, Jacob Turner, and Robert Parham. Great-grandchildren are Cora Helen Breshears, Morgan, Addison, Lily, Elijah, and Zoey Wright, Klaire Wright, and Blake Kim. She is also survived by her sister, Doris Beeson Faulkner of Camden, her sister-in-law, Bonnie Smith of Mountain Home, and many nieces and nephews. Funeral services will be Monday, March 9, at 10:00 am at Benton Funeral Home, Fordyce, with Rev. John Steelman and Rev. John Franklin Walker officiating. Burial will follow at Temperance Hill Cemetery with a graveside marking conducted by members of the Chicot Trace Chapter, Daughters of the American Revolution. Her grandsons will be her pallbearers. Visitation will be held Sunday, March 8, from 6:00-8:00 pm at Benton Funeral Home. 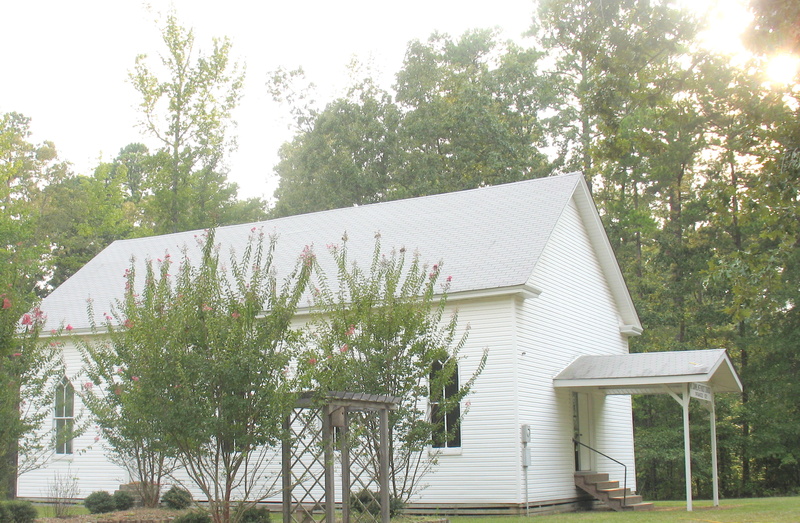 One of the most valuable lessons I learned was as a Sunday school student at Immanuel Baptist Church in Camden (Fairview), Arkansas in the mid 1970’s. Every Sunday, I’d climb the stairs in the fellowship hall up to the Sunday school rooms for the younger children. In the hallway, you could leave your offering for the week, so I would deposit my dime before walking into the classroom. Inside, there were chairs lined up for us to sit in for the large group Bible lesson, and two doors leading to the smaller classrooms where we would go afterwards for our smaller group lesson. On this particular Sunday, our Bible lesson came from Luke, chapter 21. It was the story of the poor widow and the rich men, putting their offerings into the treasury. Before we began, our Sunday school teacher, who also happened to be my aunt Rose Jane, handed out paper money in envelopes to the children. We were going to learn our lesson by performing a little skit. Not knowing entirely what the lesson would be about, I waited to be given my envelope. Others were opening theirs, to find inside many dollar bills. Wow! We were all going to be rich! Surely, I would be given the most money of everyone! She was MY aunt, after all, and would demonstrate my importance to her as her niece accordingly. I reached out to take the envelope from her, took it back to my seat and opened it eagerly…….and inside were two brown, paper coins. I was in disbelief. Wow. I got the least money of all. Why would she do this to me? Disappointed, I waited my turn as the lesson proceeded, with everyone, as the rich people in the temple, going forward to put their large sums of money in the offering plate. I, the poor widow, walked up to the front, dragging my feet a little, laid my two brown, paper coins on top of the piles of money, and dragging my feet a little, walked back to my seat. Of course, this King James Version did not make a lot of sense to me as a child of about 6 or 7, but my teacher explained to us: The poor widow gave all she had, and it was worth more to God than the money the rich men gave. Everyone turned and looked at me, the poor widow. My heart lightened and I was so excited! Of course, maybe part of this excitement was my relief that my aunt did give me the best part in the skit, after all. But, it made me so happy that God was pleased with the widow – she didn’t have much to give, but she gave it all. It was a defining moment for me and how I would approach giving from then on, even if I didn’t realize it at the time. I don’t know if even Aunt Rose Jane could have known what an impact that would have in all the years that have passed since that Sunday morning lesson. Whenever I’ve reached into my pocket (literally or metaphorically), I’m reminded of the widow’s mite, to reach a little deeper and give what I have because it is pleasing to God – and I have my Sunday school teacher, my Aunt Rose Jane, to thank for that. This year, Senior Night coincided with Halloween. Most years, that would be of little significance to me, but this year, I had a Senior. 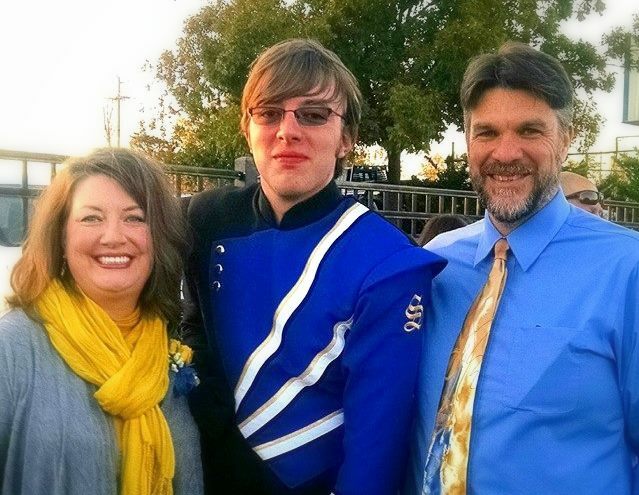 Senior Night means getting to the football game an hour early to line up with your child and nearly fifty other students who are in fall activities, like band, football, or golf, with their parents, grandparents, or guardians, and take that long, measured walk across the football field. Your destination is the spot between the columns set up to emphasize that the person between it is the one whose name is being called over the loudspeaker, and the people accompanying them are the ones who can’t believe their baby will soon be walking off into the world without them by their side. On October 31, 1996, I was six months’ pregnant and on a table at my obstetrician’s office with my husband on one side and the doctor on the other. We were all peering at the outlines of the baby, who was both within me and on the ultrasound screen, when the doctor said, “I know what it is, do you want to know?” “Yes!” we replied eagerly, anxiously, our eyes on the screen and our hands on the baby we now both could see and feel. “It’s a boy,” he said, and in a flicker of a heartbeat dreams of a Schuyler Rose and pink walls in the nursery disappeared. I swallowed a lump in my throat. “It’s Jacob London,” I said, smiling. Later I would tell my mother what we had found out at our doctor visit. “And on Halloween!” I said, with a laugh. “Must mean he’s going to be a little monster,” she said. Eighteen years later, there we stood on Senior Night, on Halloween – my son, the marching band sousaphone player, with my husband on one side, and I on the other – inching our way up the track as names were called, watching from behind those in their two seconds in the spotlight. Waiting our turn to step onto the field, my tall son looks down at me and nudges me with his elbow, then holds up his arm for me to grasp. Three stops we made along our way across the turf. “Jacob Turner” was finally announced over the loudspeaker. At least I suppose that’s what was said. He and his dad had started forward, and I, with one hand inside my son’s elbow and the other on his arm, reluctantly followed a half step behind. I knew this was not graduation; that isn’t until a late May evening, some several months’ away. Then again, this moment had always seemed far enough away and yet, here we stood already between the columns, in the first of the final rounds of letting our baby go. “Escorted by Steven and Sandra Turner.” Swallow. Smile. Walk. Pause. Release. Every year, on the 2nd Sunday in August, my grandmother’s church would have their annual Homecoming. Somewhere along the way, someone realized that August in Arkansas was pretty hot and humid to be having a service followed by dinner on the grounds. The Mt. Carmel United Methodist Church of Jacinto then moved their Homecoming to the 2nd Sunday in September. 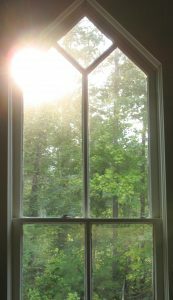 In my earlier years, we would arrive with the sun a quarter of the way across the sky, if we could see it through the leafy green oak trees towering above us. With my dad driving, of course, we’d turn off the road into the churchyard, gravel crunching beneath the tires. 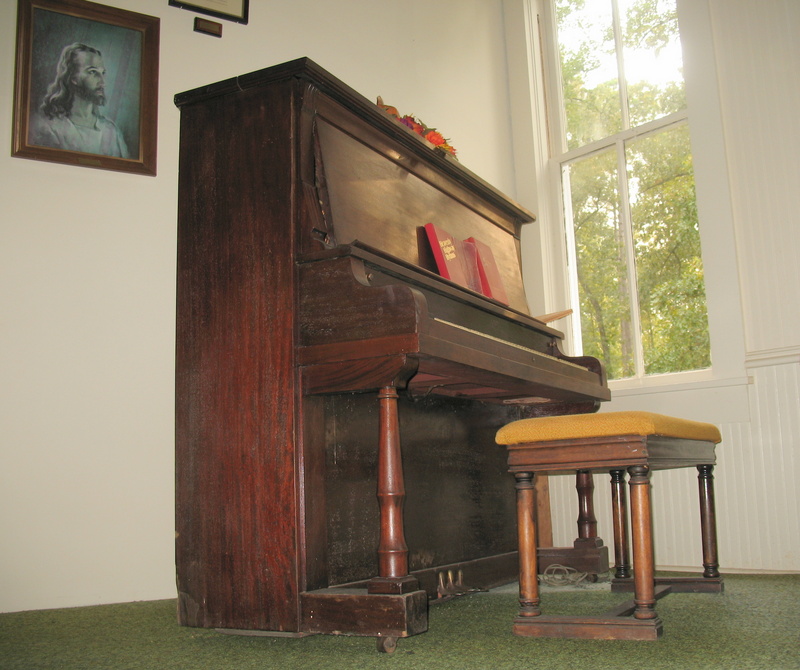 The hymns being played on the old upright piano could be heard coming through the front doors of the church, beckoning those still standing on the grounds to come in and find a seat in one of the old, wooden pews. At the sound of the steps creaking under your feet, heads would turn to see who was coming in late and then give a friendly nod to acknowledge that they were glad to see you made it. Homecoming meant signing your name in the register as you entered, so you would be sure to get a reminder in the mail some 11 months later that it was once again time for Homecoming and everyone hoped to see you again. After picking up a bulletin with the order of the service, you could usually find enough seats in a couple of rows of pews for everyone in your family to sit, if not all together, at least in close enough proximity to one another. 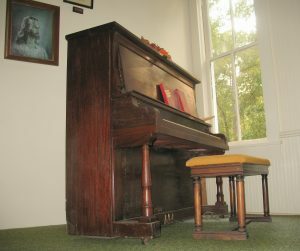 My grandmother, long-time member and lifelong Methodist, Louise Ione Gray Parham Mann, would be seated at the piano most years. She was no classically trained pianist, but she could pound out “The Church in the Wildwood” with the best of them. She would turn from her seat on the piano bench and smile to let you know she, too, saw you coming in late, but she was glad to see you made it, especially if you were one of her children or grandchildren. During the hymn-singing portion of the service, you could call out the number of any hymn you wanted to sing and Grandma would comply after the song leader repeated the hymn number, and then again for the harder-of-hearing. If it was a song everyone liked, you’d hear whispers of, “Oh, that’s a good one!” and the enthusiastic page turning to get to that hymn before everyone started singing. “The Old Rugged Cross,” “In the Garden,” and “In the Sweet By-and-By” were popular choices, and the congregation would sing along mightily. A less popular song and you would hear murmurs of, “I don’t know this one,” and hesitant, sour notes from the voices that did sing until, mercifully, the hymn would end and everyone would breathe a sigh of relief. Within these services was one of my favorite recitations to hear as a Baptist, who never heard it any other time, and that was the Apostles’ Creed. The words were printed in the bulletin, and I would speak the words along with the congregation: “I believe in God the Father Almighty, Maker of Heaven and Earth, and in Jesus Christ, His only Son, our Lord…” When I got to the words, “I believe in the Holy Spirit,” I would pause. If I completed the phrase and said, “the holy catholic church,” as a Baptist, would I get in trouble? I was already pushing the envelope being in a Methodist church, seeing as how Granddaddy Smith was a Baptist preacher who persuaded my grandmother Essie Jane Jones Smith and her family to change their Methodist ways and join the Baptist church years and years before. Of course, it didn’t help that my mother had up and married a Methodist who never converted, even though they raised us five children in the Baptist church. It certainly gave me a lot to ponder over every year when this dilemma arose. It wasn’t until years later, when I began attending Methodist churches on a regular basis that I saw the words printed in the hymnal with the asterisk beside the word “catholic,” with the explanation that the word, using a lower case “c,” was the Latin form of the word “universal.” Mystery solved. The offering plate would be passed around, and I might be given a dime or quarter to put in as it went by me. I could see bills crumpled and folded, and the occasional check, turned upside down of course because it wasn’t proper to show off how much money you were giving, with lots of silver coins sifting their way to the bottom of the plate. Then it was time for the sermon. I wish I could say I could remember at least a little snippet of any of them. After all, this was where I made the decision that when I grew up, I was going to be a Methodist. No fire and brimstone sermons from these preachers. No, their messages were mostly brief, mostly kind, and they were usually finished by 11:30 so we could get started on lunch! Sadly, I can’t recall even a little bit of them. I spent that time doodling on my bulletin or staring out one of the diamond-point windows that have been the hallmark of this church, listening to the buzz of flies when the windows were up or the hum of the air conditioner when one finally was installed. With a little sigh of relief, I would gladly rise to my feet to sing the closing hymn, which was followed by the benediction that also blessed the food we were about to eat. Since I had to wear a dress for the service, I brought clothes for afterwards; either I would have to barricade myself in one of the two tiny Sunday school rooms in the back of the church to change, and risk someone seeing me from one of the windows, or go behind the gas tank in the backyard of the church and squat clumsily to change while not being seen. It was certainly a lesson in dressing quickly, if not awkwardly. Then I would emerge, much cooler for the change, and ready to eat. Being young had its advantages. Since there were so many women putting the food out and getting things ready, I wasn’t expected to do much other than help get our food and picnic items from a box in the car. Long tables with chipping white paint settled under the canopy of the trees, groaning under the weight of so many casserole dishes, plates of fried chicken, potato salad, homemade sour pickles, bowls of butterbeans, pies, cakes, everything you would expect to find at a church potluck. There was so much food; it was hard to decide what all to eat – so I usually got too much, and then would hear, “Your eyes got too big for your stomach,” when I still had a half a plate left to eat after getting full. There was an addition of an honest-to-goodness outhouse a little ways into the woods so that you didn’t have to find a spot behind a tree (not that I ever did! I would wait until we got to Grandma’s house rather than risk getting covered in ticks and chiggers). A bathroom with running water eventually was built close to the church, which has made it easier for everyone to stay longer. A pavilion, built from the trees that once shaded the old tables holding the food, was designed by my brother and built with the work of men who had ties to the community. A memorial garden, the Eagle Scout project of one of my nephews, sits next to the church and offers a little spot to sit and reflect in the shade of the crape myrtles. Many Homecomings have gone by over the years. The old Mt. Carmel Methodist Church is no longer an organized church, but a building on the historic register. It’s still as beautiful as it ever was, sitting quietly in the back of the churchyard, white paint a little chippy but nonetheless comforting in its familiarity. Stepping into it, you can see the pews, the green carpet, the portrait of Jesus on the back wall and remember all the faces from over the years who once turned to greet you with a smile. Every year the crowd appears; slightly different and slightly smaller due to the passing away of those with the familiar faces, and their families from farther away not coming anymore. It’s true that you can’t go home again, but you can go to Homecoming every second Sunday in September, and feel like you’ve come back to where you belong.